The footed silhouettes of these jars are so beautiful, they lend themselves to both contemporary and vintage-rooted interiors and make such beguiling storage for trinkets or tasty treats! I'd been without any until spotting a couple in a local interior shop at much more reasonable prices than I'd seen online - I was thrilled to get a large and a small jar for around £20 so you can imagine how pleased I was to find the one below for £1.50 in the British Heart Foundation. Add to that the little mercury/silvered glass candle holder I picked up for 50p and I was bouncing out of the charity shop a very happy girl! 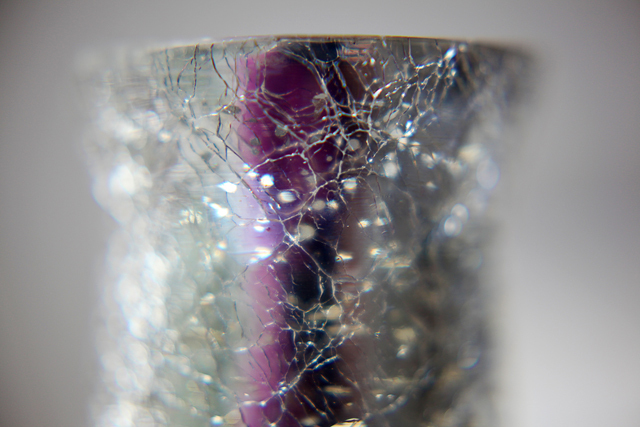 I'd been looking for one for such a long time as I love the crackly silvered effect but just hadn't come across one until last week. This large jar was one of the two I bought from a local home shop, I was searching for something to fill it with but thought sweets might not be appropriate for a bathroom so chose some of my sparkly, feather butterflies instead - I'd put these in every room if I had more of them! The little purple candle holder was a 30p find from the Salvation Army shop and I'd really like a couple more - will be keeping my eyes peeled. They are so pretty! I love apothecary jars! Thanks for sharing. Visiting from Debbiedoo's party and am your newest follower. I hope you'll come visit my new blog too! 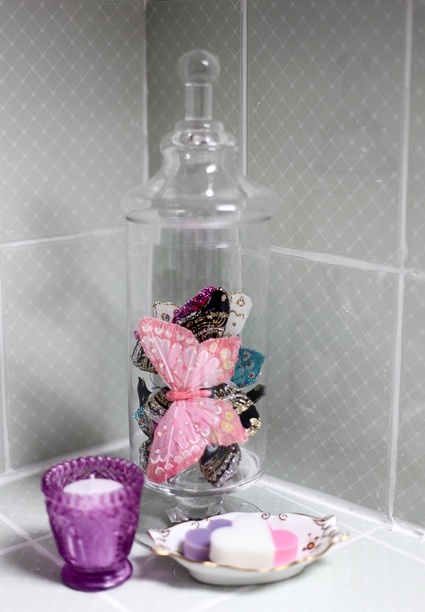 That is such a pretty jar and I love your faux butterflies! Too cute!!! So very pretty and ready for Spring. I am so happy you joined my newbie party. Have fun! Beautiful jars! I have the first one you posted and found it at a thrift store for next to nothing. You're right, you can fill them with pretty much anything lovely! Yours look great. Don't you love it when you find the treasures you have been searching for. Love your finds - especially the apothecary jars. Great finds! The butterflies look lovely in the jar. The jar looks so beautiful with the pretty butterflies in them! Where did you get them from? Lovely jar, gorgeous little dish and I love your tiles! Lovely, lovely finds and although not usually a huge glass fan, I do like those jars. Butterflies would go down very well with my little girl who has a thing about them. Love the jar - what a find - and all in a good cause! I have NEVER found an apothecary jar (sobs), you are so lucky. You've displayed it so beautifully too. 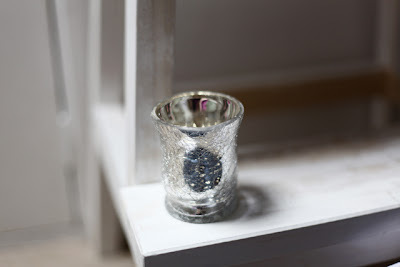 Love the little silver candle holder too. What great spots! What beautiful buys, love them all! Awesome jars!! They are lovely!! I'm visiting from Debbie's party, and I'm your newest follower!! You certainly have a good eye. I love the little vase and the butterfly idea! I love apothecary jars also. I have small soaps in the one in my bath. I am constantly changing things in my others. 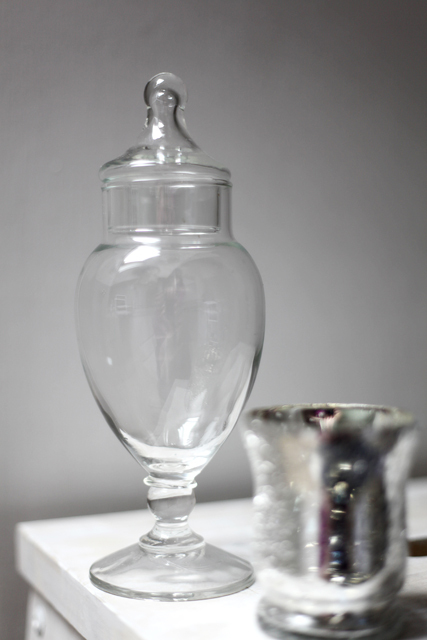 Aaaaah - apothecary jars and mercury glass - two of my favorite things! Pretty finds! Also loved the pictures of your tea wares. Just found your blog and I'm pretty sure we could be friends. Not only do you live where I would like to live, but you love to surround yourself with beautiful things.I think of my look as "organized abundance", but I prefer "beautiful clutter".Anyway, I'm a new follower looking forward to getting a glimpse of your world.Visit me at Brambly, I would love to have you drop by. Take care. I think I have the twin to your apothecary jar, I found one just like it the other day at our Good Will! I haven't filled mine yet. Your idea with the butterflies is so creative. I'm a collector of pretty things too and a new follower. Would love to have you visit my nest eclectic. cute finds! Thanks for coming by my blog! I love apothecary jars & have several that I use in different ways around my home. Do you have Michael's stores over there? I have found really cool ones there, but always use a 40% or 50% off coupon. I really like your other items, too.